My guy is always telling me I should become a member of the yarn bomb movement. I’ve wanted to, it just never seems to happen. Until now. As part of his grand 30th birthday gift, my sister helped me yarn bomb him a sign on some old palm tree at the Empire Polo Club during our yearly pilgrimage to Coachella. I’m officially a part of the crew. And we have no idea where this installation art ended up; we ventured back to the tree, and it was gone, only to forever be memorialized in a photo. If you are unfamiliar with the yarn bombing practice, often called “guerrilla knitting”, then do check it out. 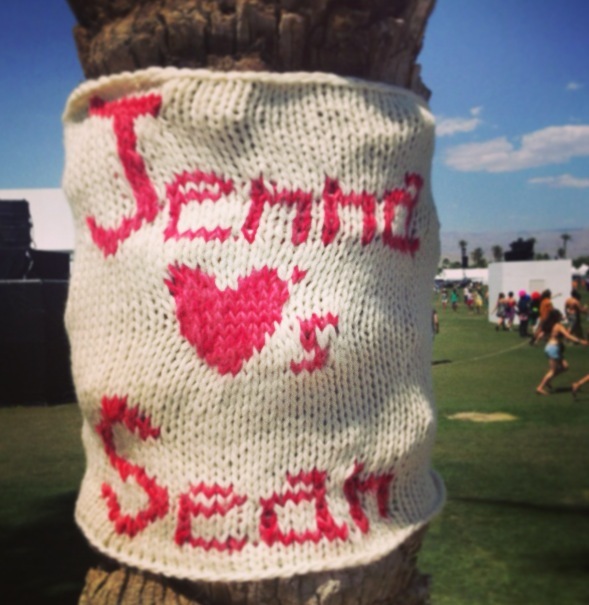 For more snaps of my yarn bomb, check out my Coachella photo set.